The BepiColombo mission is traveling to Mercury powered by ion thruster engines built into the Mercury Transfer Module component visible at the bottom of this artist's depiction. The BepiColombo mission to Mercury that left Earth on Oct. 19 has a long, seven-year journey ahead of it, but the spacecraft just ticked off an important milestone. 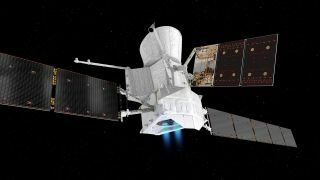 On Dec. 2, the spacecraft used two of its ion thrusters to make its first maneuver — a procedure that came after weeks of careful testing. The success means that the most powerful electric-propulsion engine system ever to explore space is now up and running. "Electric propulsion technology is very novel and extremely delicate," Elsa Montagnon, Spacecraft Operations Manager for BepiColombo, said in a statement released by ESA. "This means BepiColombo's four thrusters had to be thoroughly checked following the launch, by slowly turning each on, one by one, and closely monitoring their functioning and effect on the spacecraft." The team also needed to fit in that testing during the time when the spacecraft would always be visible from and point its antennae toward Earth so that they could properly monitor the tests. In mid-December, the thrusters will begin the series of 22 long burns that will be necessary for it to reach Mercury. The entire journey will cover 5.6 billion miles (9 billion kilometers). BepiColombo's powerful ion thrusters are located on the Mercury Transfer Module, which is ferrying the mission's two science orbiters to Mercury. Once the assembly arrives in 2025, the three spacecraft will separate and the orbiters will bid farewell to the electric engines and their eerie blue glow.